​Ellis Angel is an emerging activist artist. 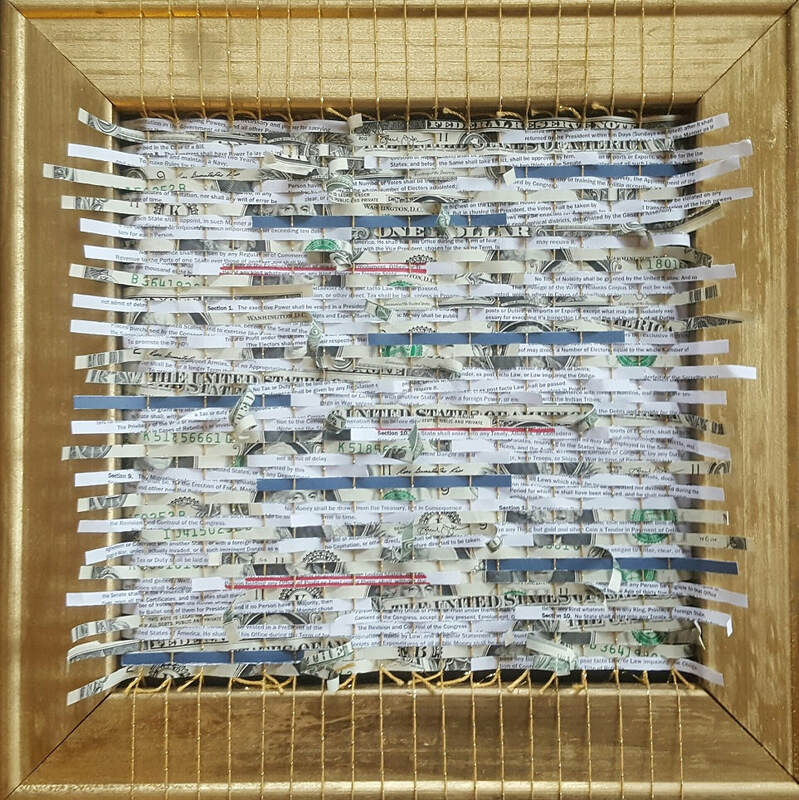 With a concentration in mixed media, more specifically paper weaving; Ellis seeks to reduce text and meanings to their basic parts in order to provide the viewer with a different reading of the theme. In “Article I, Section 9, Clause 8,” Ellis provides a commentary or subtle protest though the subversive nature of destroying something of value. 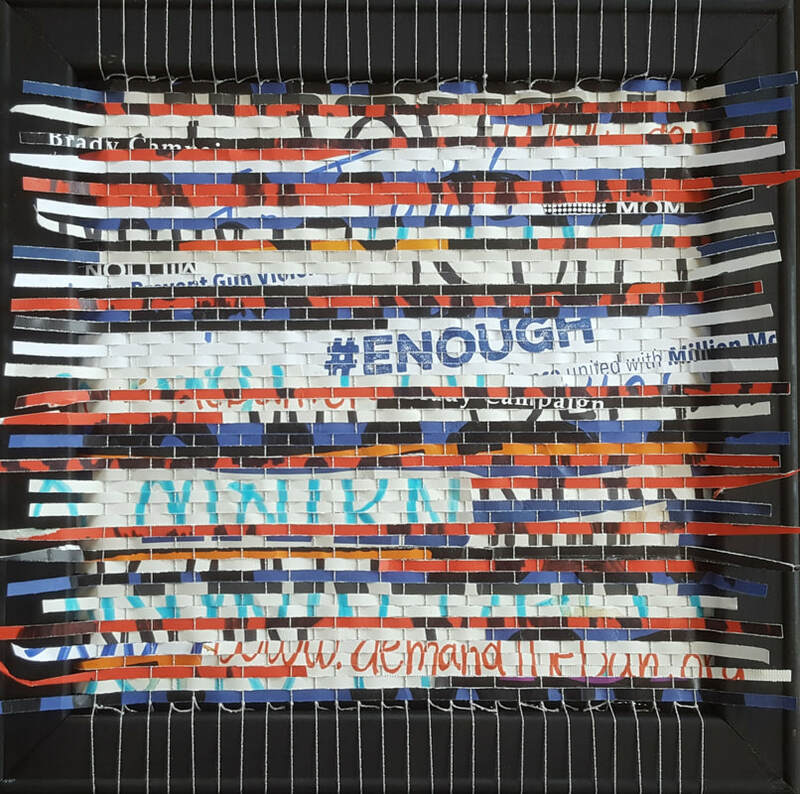 With the Women’s March and March for Our Lives series, found protest posters are shredded then woven back together into a more permanent symbol of protest and serve to document the movement. 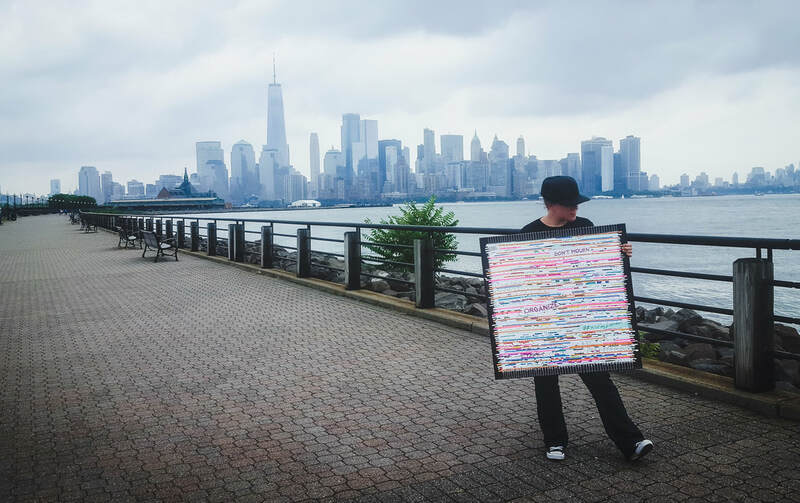 Embracing the more female realm of weaving, but using paper rather than textiles, Ellis uses one of the oldest art forms to say something of current affairs. Well, to be honest, I would still be hesitant to call myself an artist. I’ve had no formal training and lack a lot of validation there. But, I’ve always tended to make things or repurpose items. My mother had an antique shop when I was growing up and I learned that there could always be more than one purpose for something, you just had to assess the need and figure out a solution, touch it, flip it over, look at it a different way. In the same way, I’ve tried my hand at various forms along the way, photography, painting, collage, weaving, and sewing. So, I would say that I’m very much still emerging as an artist. I would say that the message has driven the medium with these series. I’ve played around with various media over the years. But, since the election of President Trump, I feel like I have grown increasingly irritated with the blatant disregard for separating personal holdings from that of the Presidential office. When the ACLU pocket Constitution came in the mail, I knew I wanted to use it somehow. I had circled the emoluments clause and had it on my desk for a while. When a fellow weaver let me borrow a loom over the holidays, I knew that the loom was the answer. I’ve taken some liberties with the “loom” a bit, but weaving has been the answer I was looking for. I hope to evolve my style by reading up on the techniques and perspectives of artists I admire and find inspiring. Well, I haven’t quit my day job. So, I only get the opportunity to work on my projects a few days a week so I’m usually chomping at the bit after a week away. I love to work in the morning. After the usual morning routine, I like to sit down with a big cup of coffee and get to work. Every morning is a fresh start and I feel the most productive and fresh when the sun is on the rise. If I can prep the frames and have everything warped ahead of time it really helps to just get started weaving. I try to work on just one piece at a time. I try to stay focused on the end goal. The problem is that I tend to get excited about a new project or idea and it is easy to walk away from something and not come back to it again. It’s like finishing one book at a time, I’m usually pretty good about it, but there’s always a rotation of about 5 open books lying around. My partner jokes about a painting that I have been “working on” since high school, that my children will finish it someday and it will be the ultimate collaborative project. I’ve been working on my Article I, Section 9, Clause 8 series, but after attending the Women’s March NYC in January, I couldn’t help but to work on the Women’s March weavings from the found posters I took home that day. It’s like stripping all those voices down then weaving them back together into one big visual yowl. Strong, empowered women. My work seeks to make a political statement, to make someone stop and consider their point of view, if they agree with me or not, and hopefully drives them to act – be it to vote, or to explore the topic at hand. I must be doing something, because, in addition to the positive support, I’ve started to get my first trolls online. That is to be expected, we live in divided times. But, it’s having strong, empowered women to emulate and look up to that really empowers me as an artist. Trying something new is definitely exciting and anxiety inducing. With the emolument weavings, I had the idea in mind; I knew that I wanted to shred money and the US Constitution. I had underlined the Title of Nobility clause in red in the ACLU mailer long before I had a frame or anything warped. What I’m doing is not strictly legal, but the Federal Reserve does have a history of respecting art and embracing activism. That said, I work hard for my money just like the next person, and you have to mean it. I suppose to be an Activist, you must Act, so I guess you have to take that leap. I place a lot of value in things I shred so I want the end result to be worth it. But, I’m willing to put my money where my mouth is, literally. Now rather than being anxious about the process, I’m more anxious about putting the weavings out into the world. So far, the responses have been overwhelmingly positive, but I expect that I will get more push back as I move along. So, I guess I’m more concerned now with pushing the boundaries against the conservative, right-wing, pro Trump agenda. ​Do you enjoy having the "duality of both chaos and control" or are you happiest with a set plan? I definitely lean toward the control side of life. I like having a plan; however, I’m usually game for changes. For instance, I tend to draw out my ideas on paper. But, when it came time to work on my first emolument weaving, when I considered making President Trump’s profile in the center, it just didn’t take. The contrast between the Constitution and money, coupled with the weirdness the basket weave creates when you separate the two texts, it just couldn’t be done well. It forced me to take a more subtle route and mix the two texts together and looks better for it. So, I tend to have an end product in mind; however, sometimes it doesn’t turn out quite like I had imagined. ​As you know, we have seen the conditions, treatment, and process immigrants and their children are facing when fleeing to this country. I have salvaged an antique child’s bed frame from the gallery district and I will be creating a protest weaving centered on our current immigration practices. As far as events go, there is a show wrapping up at the South Arkansas Arts Center in El Dorado, Arkansas. My work will will be featured in “Uprising: The Art of Subculture” at the V°lition Gallery in Orangeburg, NY through September 15th and an emoluments weaving is headed down to Tallahassee, Florida at the end of the month for Florida State University Museum’s 33rd Annual Tallahassee International Juried Competition Exhibition. 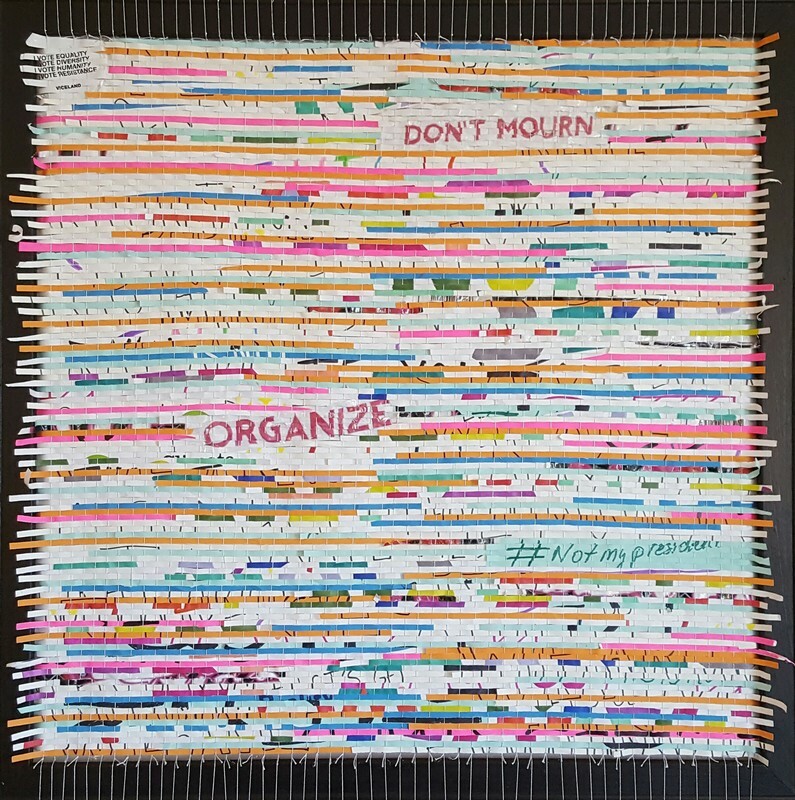 For next year, a Women’s March weaving will head up to the Harold Hacker Hall of the Central Library in Rochester, New York for the “Crafting Democracy: Fiber Arts & Activism” exhibition from August - October 2019.